This is the ultimate breakfast treat. My goal was a homemade version of a Drake's Cake, but better. As if the cake wasn't delicious enough, I decided to drizzle maple icing on the top and give it an extra-special flavor. This recipe can also be made into muffins. Cream the butter and sugar in the bowl of an electric mixer fitted with the paddle attachment for 4 to 5 minutes, until light. Add the eggs one at a time, then add the vanilla and sour cream. In a separate bowl, sift together the four baking powder, baking soda, and salt. With the mixer on low, add the flour mixture to the batter until just combined. Finish stirring with a spatula to be sure the batter is completely mixed. Let cool on a wire rack for at least 30 minutes. Carefully transfer the cake, streusel-side up, onto a serving plate. Whisk the confectioners' sugar and maple syrup together, adding a few drops of water if necessary, to make the glaze runny. 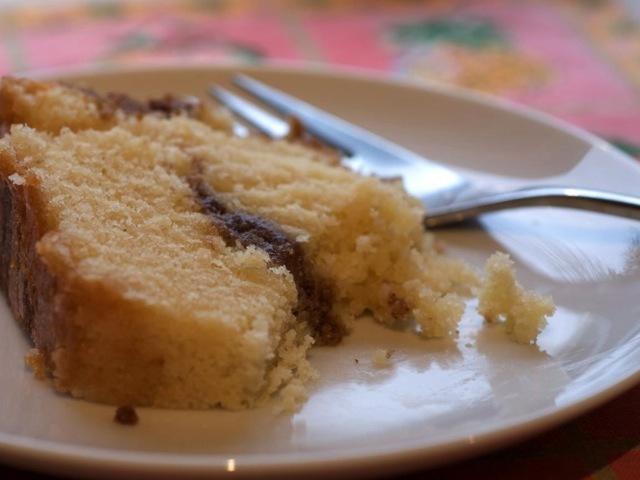 Drizzle as much as you like over the cake with a fork or spoon. If you don't have cake flour, you can substitute 2 1/4 cups all-purpose flour plus 1/4 cup cornstarch. If the eggs are cold, place the whole eggs in a bowl of warm water for 5 minutes before cracking them.